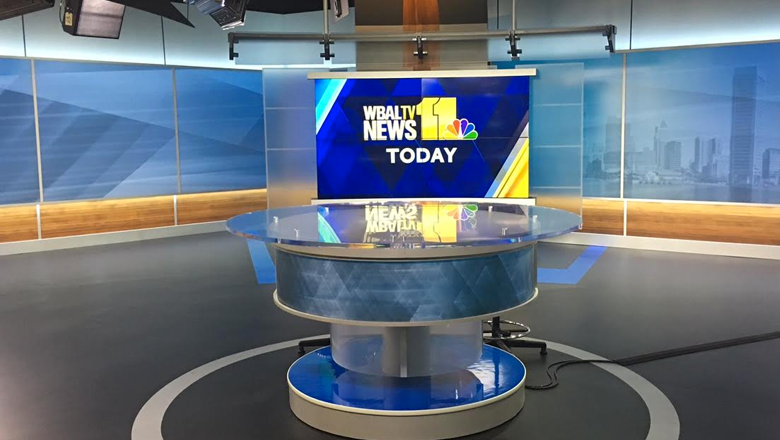 Hearst’s WBAL-TV debuted an open and fresh new set Monday that’s defined by broad rectangular shapes accented with diagonal strokes. 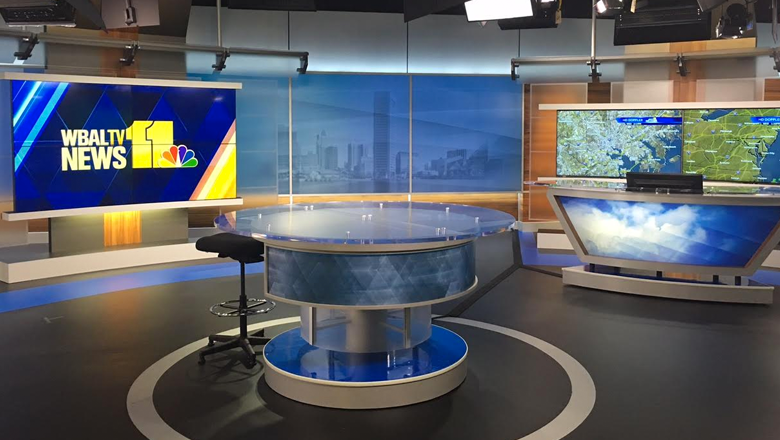 The new look, from Devlin Design Group, features a circular standing anchor desk at the heart of the studio. The tiered design features metal and printed graphic layers featuring the Hearst diagrid, as well as a sleek glass top. The overall theme of the set is a light and airy feel — perhaps subtle nod to the city’s close ties to the water. Mixed in with this are stronger, more industrial elements that play homage to the city’s more modern architectural touches. For primary anchor shots, talent is shot at an angle into the corner where two perpendicular walls meet. Placed on a diagonal in this space is a freestanding 2×2 flat screen array from Primeview flanked by frosted panels on both the sides and above. The side panels feature a wide translucent grid pattern, while the ones above are held in place with a ceiling mounted metal half-frame. Above this is a light-toned and clean header with accent uplighting. On either side of this area are printed graphics in thin metallic frames that incorporate both triangular shapes and city imagery. All of the panels throughout the set are equipped with color changing technology. 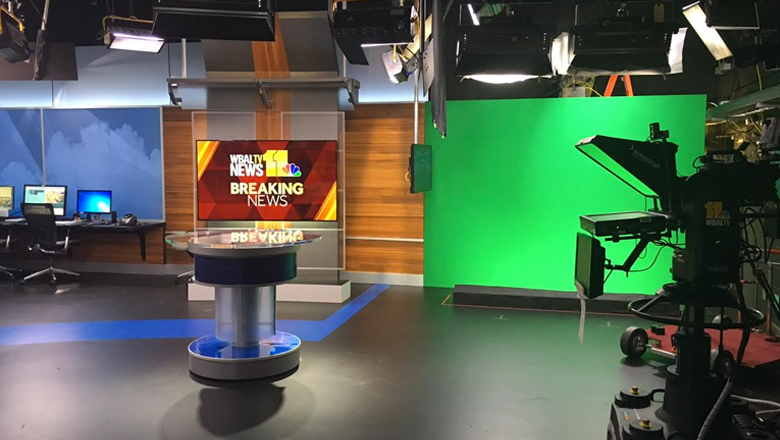 The station plans to use red for breaking news, while changing to violet for Baltimore Ravens coverage and orange for Orioles stories — a nice way to build a connection with viewers’ loyalty to hometown teams. To the far left of the space is a multifunctional area that includes the option to be used as both an interview set as well as standups — both of which can take advantage of the larger video wall here, also from Primeview, who also handled the studio’s A/V integration. The same ceiling mounted and vertical frosted panels are found here, though the walls become more wood tones in this part of the set. The weather center, meanwhile, is located on the opposite side of the studio and uses a combination of wood and printed graphic backgrounds. A presentation desk, fronted with a polygon shaped printed graphic, is positioned in front of a strip of video panels for displaying weather data and maps. 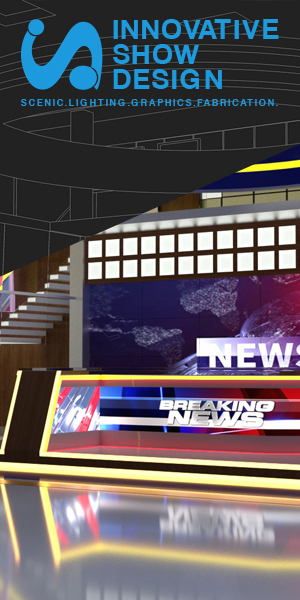 Next is a series of workstations followed by a narrower, vertical wood toned wall with a flatscreen and smaller version of the main anchor desk, designed for a variety of uses, including breaking news and weather coverage, standups and special reports. 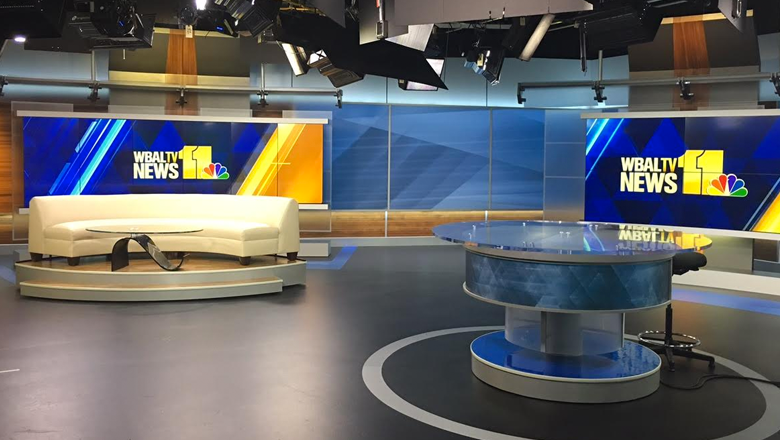 Throughout the weather center, the design’s ceiling mounted and wall-style frosted panels are incorporated into each section, continuing the cohesiveness found throughout the rest of the set. The airiness and openness of the design is further emphasized by a sleek gray studio floor and careful spacing between each element of the set.